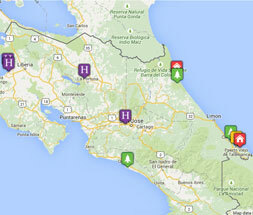 Tribes Overall: "We had an altogether fantastic time in Costa Rica. It's a beautiful and very varied country, the local people we met were all very friendly and helpful, its easy to get around." Tribes Service: "Anita kept us well informed on progress and made helpful recommendations. The balance of different locations was just right. If we would have changed anything we would have spent one day less in Arenal and one more in either Monteverde or Cristal Ballena." Guides: "All were excellent (although I struggle to remember all their names). Nancy, who took us on our trek through the forest in Arenal was particularly engaging and informative. " Social & Environmental Responsibility: "The Costa Ricans are rightly proud of their natural heritage and take environmental responsibility very seriously." A beautiful, traditional Spanish colonial style hotel close to the centre of town - a very special place to stay for our first two nights. The restaurant is excellent too, so much so that we ate their both nights. All of the staff were very friendly and welcoming and the housekeeping was of a very high standard. This is a big resort hotel and so pretty busy, but we were upgraded to Premier rooms from where we had great views of the sea and were able to watch the toucans in the trees opposite. The restaurant is very good but quite pricey, especially the wine, so we out out in the evenings in Manuel Antonio, where there are plenty of good, reasonably priced alternatives. This was not our favourite hotel. Although it is located right in the forest - good for spotting Howler Monkeys as you drank a cup of coffee in bed - the hotel is a bit tired and this was the only place in CR where we found the service a bit workmanlike. The restaurant has a bit of a functional feel about it - more like a school dining hall than a cosy place to eat, and as a result we went out to eat both nights in La Fortuna which has lots of options with a bit more character. We used their hot pools, which are located a km or so away (shuttle bus provided) which were enjoyable but less so than the ones we were taken too after the Sky tours. "We were glad to have a day at the start in San Jose to get our bearings, recover from the flight and look around. We visited the magnificent theatre and the new museum under the adjacent Piazza which brought us up to speed on the history of the country. We enjoyed our first Costa Rican coffees, too! The weather when we were in Monteverde was unusually windy and so not ideal for spotting animals, but we nonetheless enjoyed both our day and night treks and saw plenty of flora and fauna. Having got our eye in, another day to wander through the park when the weather improved would have been good. The highlights of our stay in Arenal were the sky trek, tram and zip wire experience, which was both exciting for us as oldies as well as extremely well and safely organised. One of our number used to run an outdoor activities centre and he couldn't fault their safety measures. The the trip to the hot springs in the evening was magical; sipping cocktails in the lovely hot water as the sun went down was magical, and not too busy, plus the buffet dinner afterwards was much enjoyed. The volcano walk was ok but less interesting than the cloud forest, although we saw loads of orchids. Otherwise there is not too much more for our age group in Arenal and we could have used one day better elsewhere (although we found the best coffee in Costa Rica in a back street cafe!). Cristal Ballena is in a fabulous location and we enjoyed unwinding a bit after our eventful first week. We spent a day on the beach in the national park immediately opposite the entrance to our hotel. It was like something out of a travel brochure and amazingly we seemed to have the beach almost to ourselves, even though it was a Sunday. Very relaxing all round. By the time we got to Manuel Antonio the schools in the USA were on break so it was very very busy, but even though we saw and heard a lot of Braticus americanus vocalis, the wildlife seemed to be used to it and we saw lots that we hadn't ticked off before. We spent a lazy day on the public beach near the hotel which we enjoyed as well. We found the driving pretty straightforward - until we came to return the car to the depot in San Jose. This is reasonably close to but not actually in the airport and the guy who had brought the car to our hotel left only scant instructions as the where to return the car. I asked him to programme it into our GPS but the location he saved in favourites was several miles away from where we were meant to be. Happily we had about 90 mns contingency to spare and eventually found it. We found the maps available to be all fairly inaccurate so the downloaded maps on the Vamoos app were invaluable as they were much the most accurate and we could actually see where we were the whole time. It can also be used for route planning but we couldn't find a way of downloading our route so that we had that available offline as well which would have been useful. It would also be a good idea for self-drivers to programme in the location of the car hire depot as well as all the hotels."